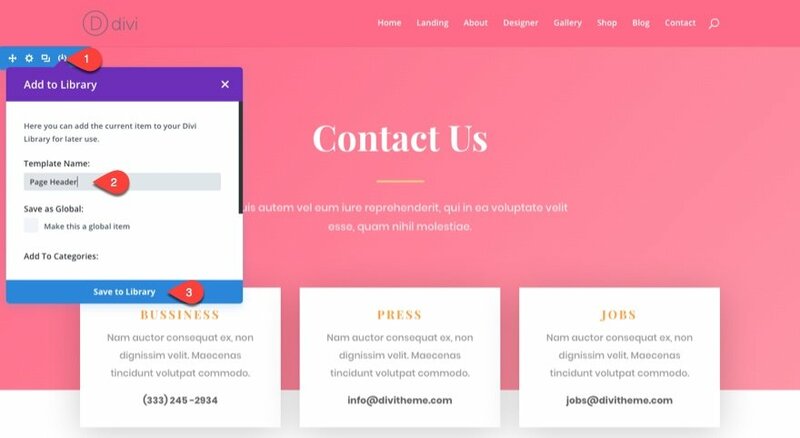 As a part of Elegant Themes’ Divi Design Initiative, Kenny and the design team have been spoiling us with brand new FREE Divi layout packs every week. The layout packs can be downloaded from the blog post featuring the layout pack every Monday. Many of you have used the layout packs to build brand new websites in a very small fraction of the time it would normally take you. In today’s post, I’m going to show you how to get the most out of these layouts by offering 10 key steps to follow when using a new Divi Layout pack for your next project. I’ve also included some not-so-well-known tips to handle these layouts like a pro. Note: Like all steps, these are meant to be done in the order that they are listed. For example if you don’t set your default color palette first, it won’t be available when you go to change your default accent color. 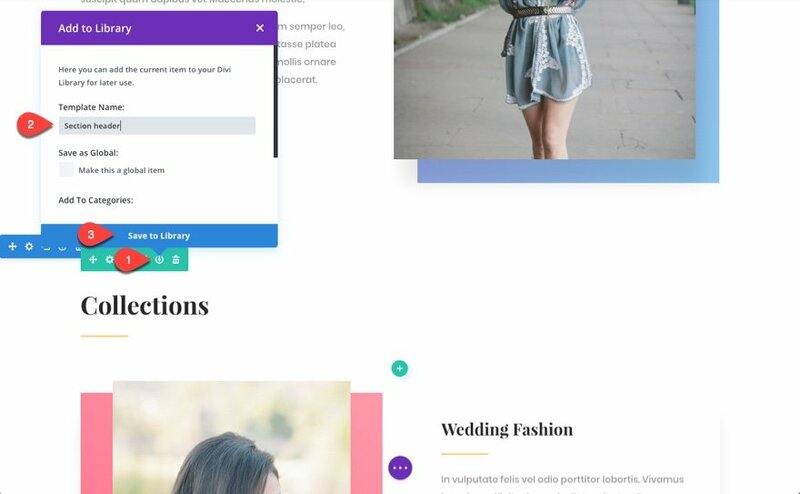 The best way to add new layouts to your Divi Theme is to import them into the Divi Library first. Then, when creating a new page, you can add the new layout from your library. Before you add the layouts to your website, you need to make sure and download the layout pack from the blog post and unzip the file. From your WordPress Dashboard, go to Divi > Divi Library and click the Import & Export button at the top left of the page. In the portability modal that pops up, select the import tab and click choose file. Find the unzipped layout pack folder and select the json file with “All” in the filename. This will upload all of the layouts to your library at once, instead of having to do each of them individually. For example, if you are wanting to upload the fashion layout pack, you would choose the file named Fashion_All.json from the layout folder. 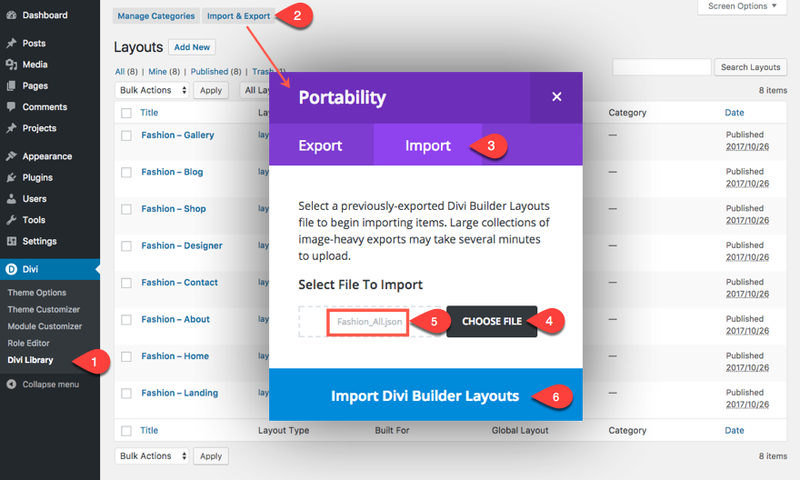 Then click Import Divi Builder Layouts. This process is pretty straightforward. 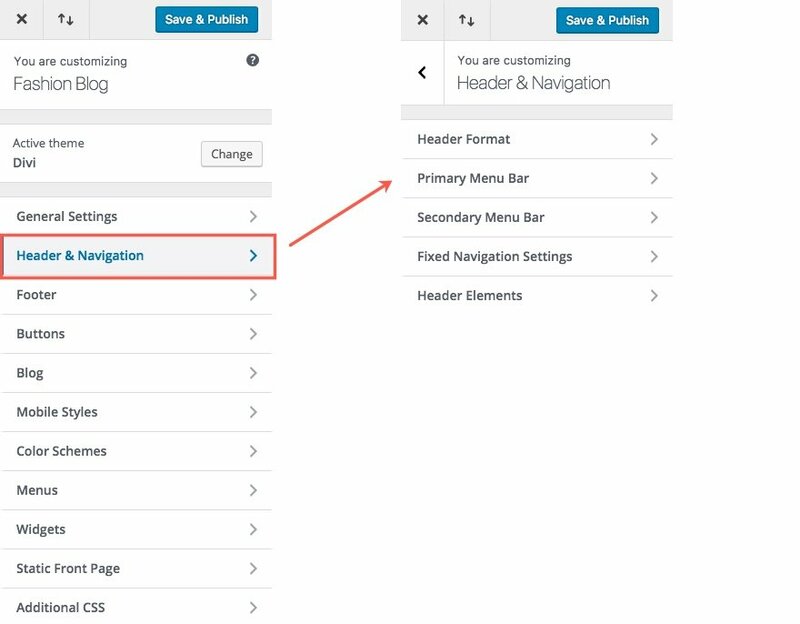 From your WordPress Dashboard, go to Pages > Add New. Enter the Title of the page you need to create. 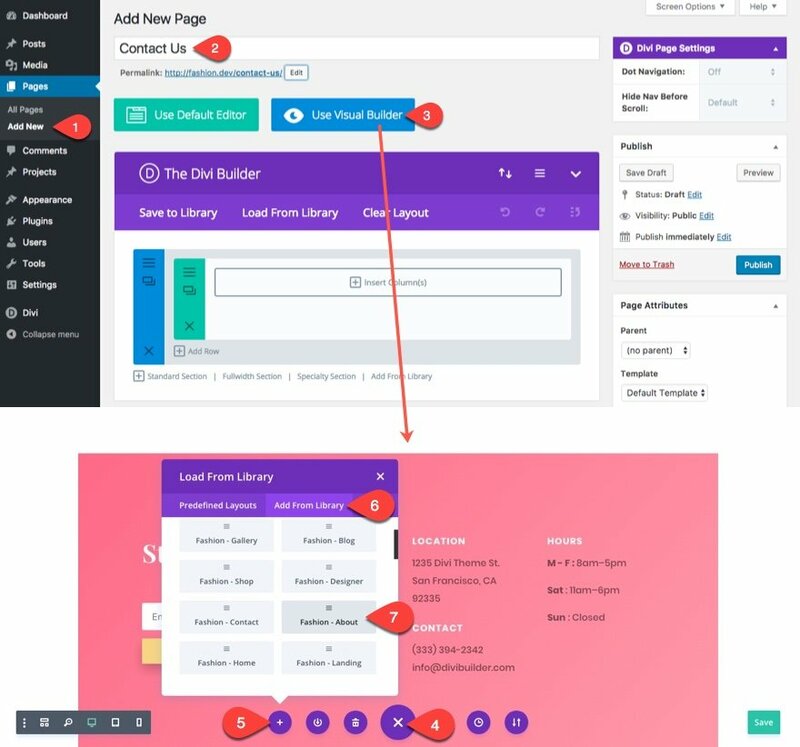 Click to use the Divi Builder and deploy the Visual Builder. Open the settings menu at the bottom of the page and click the “Load From Library” plus icon on the left. In the Load from Library modal that pops up, click the “Add From Library” tab and select the new layout from the list to load the new layout. Repeat this process for each new page, adding a new layout to each one. If this is a new install, you will start to see these new pages in your primary menu bar in the top header. This is because you don’t have a primary menu created yet so by default your menu will get populated by all pages and posts you add to your site. 1. Navigate to Appearance > Menus. 2. 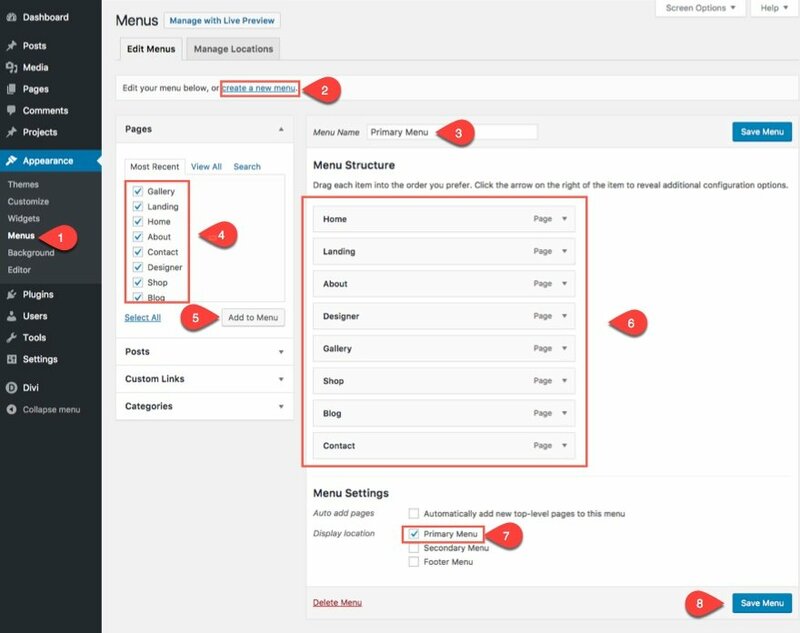 Select the “Create a new menu” link at the top of the page. 3. Enter a menu name. 4. Select your menu items in the left toggle under Pages. 6. Organize your menu items by dragging them into place. 7. Under menu Settings at the bottom of the page, select “primary menu” as the display location. I often forget to do this step and regret it everytime. Setting you default color palette makes it really convenient to edit colors using the Divi builder. I can’t tell you how many times I have to go back to another module to find a color code, or inspect an item using developer tools, or use my eye dropper browser extension just find the same color I’ve been using over and over again. Don’t do this to yourself! 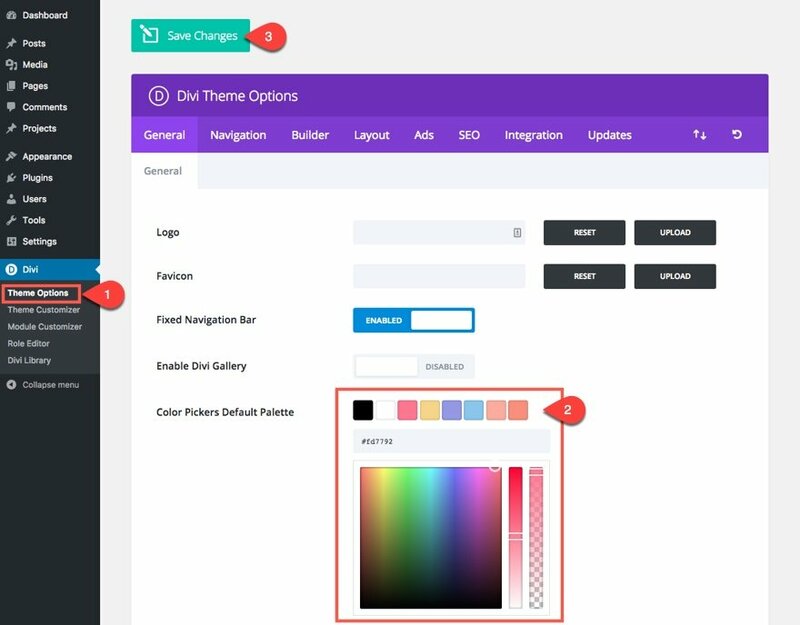 You can set the default color palette by going to your WordPress Dashboard and navigating to Divi > Theme Options. And right there in the general tab you will find the option listed. Add the colors your need there. It is always a good idea to keep the color white (#ffffff) and a couple of dark colors (like #333333 or whatever you have set for your dark font color) to be used for styling backgrounds and text easily. You will probably find your way to the Theme Customizer fairly early in your process of customizing your new site. When you do, you should change the global accent color first. To change you Global Accent Color, go to the Theme Customizer and navigate to General Settings > Layout Settings and find the Theme Accent Color option at the bottom. Notice the new colors available to you in the color palette since you updated the default color palette in your Theme Options. Then, once you change it, save & publish your settings and refresh your page. The updated Theme Accent Color will be applied to about 20 other elements automatically which is why it is important to update this first. If you don’t see the changes take effect on these elements immediately, you may have to save and exit the customizer, refresh the page, and go back in to the customizer. You can style your header from the Theme Customizer. Simply go to your WordPress Dashboard and navigate to Divi > Theme Customizer > Header & Navigation. You will definitely need to style your header to match your new layouts. 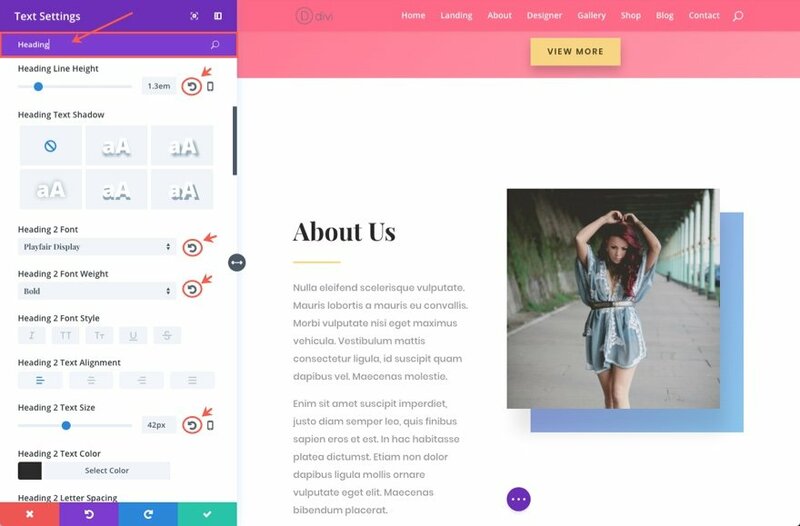 First I would decide on the header style you want first (default, fullwidth, centered, etc…), but whatever you choose, make sure to match the style of your header with your new layouts. And, make sure the items in your menu are easy to read and navigate. You have options for your primary, secondary, and fixed navigation menus. Take the time to style all that apply to your site. If you set your global accent color, some of the header color settings will be changed for you. That’s why it is important to set that color first. You can style your bottom bar also from the Theme Customizer. Simply go to your WordPress Dashboard and navigate to Divi > Theme Customizer > Footer > Bottom Bar. The bottom bar shouldn’t be neglected. Combined with the Navigation bar a the top of your page, it becomes a necessary bookend that frames the entire page. Sure, the default black background can pretty much “work” on any site, but I would experiment with it a bit more. Sometimes I like to give the bottom bar a background color that is a slightly darker shade of the footer section’s background color sitting directly on top of it. 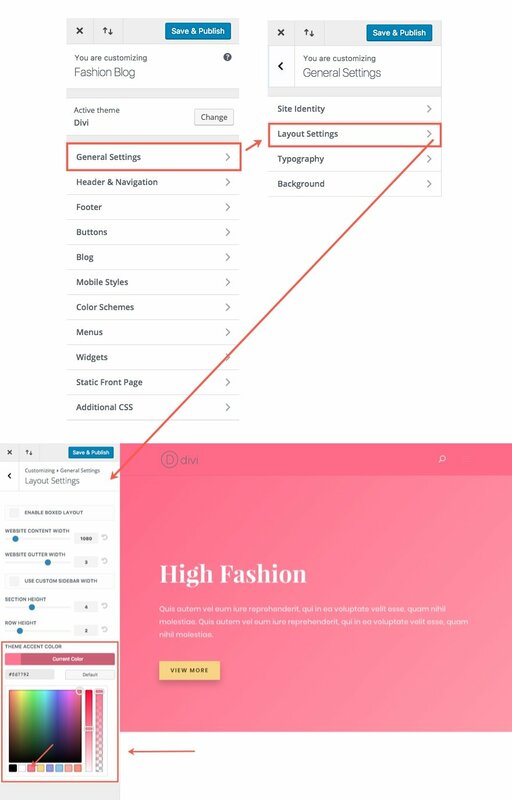 Because your layouts come with design settings built in to your modules, making changes to your design settings on a global scale (sitewide) can be a little tedious. But there are a few tricks to speed up the process. For starters, I would make changes to one page layout first. That way you can save elements from the edited page to add to your other pages that need design changes. Here are some tricks to speed up the process of making design changes to a certain layout. Don’t forget that you can use the right click options to copy and paste module styles from one module to the next as long it is the same module type. 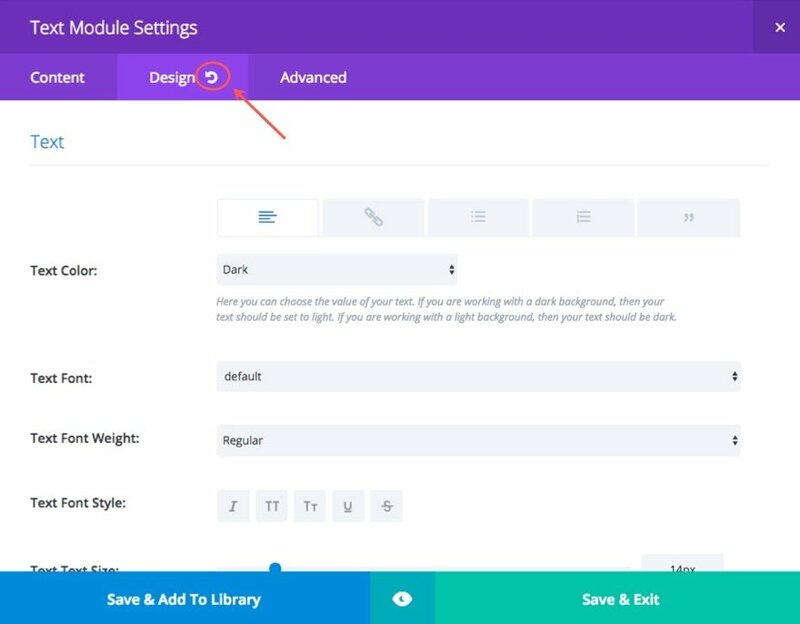 Currently there are certain settings available for modules that aren’t customizable by the theme customizer (like box shadow for example). As a general rule, the Theme Customizer will change whatever is left to the default setting within a module, if that setting is available in the customizer. But for some modules, it may make sense for you to go ahead a restore certain design settings to their defaults so that you can control the style from the theme customizer. A good use case for this would be body text and header text settings. So, for example, if you have a text module in your layout that has a custom font, text color, and text size, you wouldn’t be able to change those elements from the theme customizer until you restore them to their default status. As you search for the options you want to change, you will notice that some options have a “restore default” icon next to it. This means that it has been changed from the default. For those of you who love the visual builder as much as I do, you probably have yet to discover this helpful trick. If you are in the backend builder, click to edit a module’s settings, and then select the design tab. Notice anything? It is a little “Restore to Default” icon/button located within the tab. Clicking that will prompt you to confirm you want lose those settings. If you select yes, all of your design tab settings will go back to their default state. This will, of course, be added to the visual builder in the future. Sometimes you will need to create additional pages or posts that require a different layout. Maybe you want a more general page layout with a header, content section, and footer section. Or maybe you want to create a more elaborate landing page. You may even create a custom post layout for your blog posts. The easiest way to accomplish this is to use elements of the layouts you already have to build new ones. And, it is the most effecient way to keep your design consistent accross the entire site. Let’s go over a few of the basic elements you should consider using to build additional page layouts. This is a no-brainer. Every page needs a header. I would definitely save a header section for your library. I would suggest find a more generic version of your headers so it will fit with any page type. Usually the contact page layout is a good candidate for this because it usually has a basic centered title, subtitle, and a background color. It is also a good idea to save a version of your section headers. That way when you are adding more content to your new pages, you will have a new header styled and ready to go. 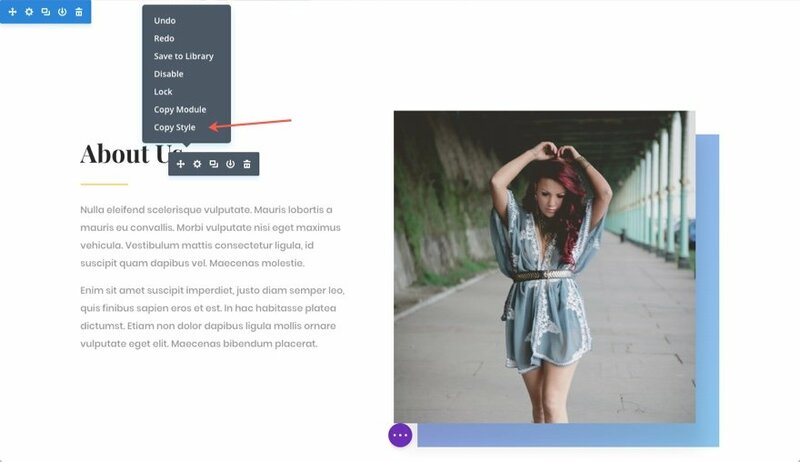 In many cases, a simple text module with a white background is all you need for this, but sometimes your new layouts have unique content sections. 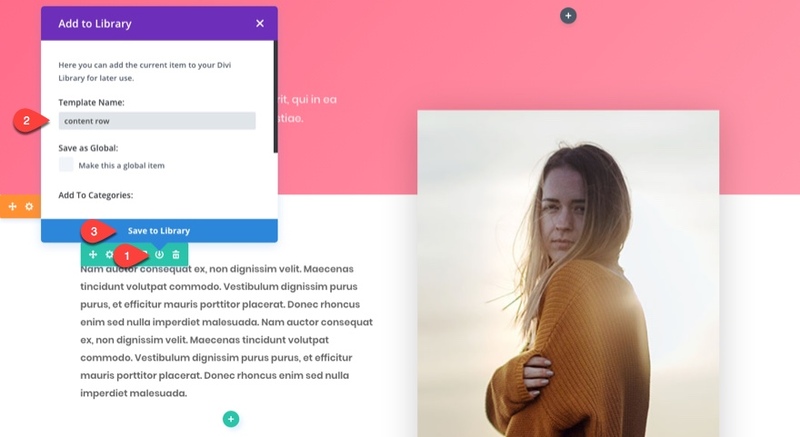 This may be a text module with box shadow or multiple blurb modules styled in a unique way. In order to keep the consistency, save what you need to the libary for future use. You will probably need to add more buttons as you create new pages. Having a dark and light version of your button available in your library is extremely convenient. I suggest saving a button module for both dark and light versions. Each layout usually comes with a nice footer section that sits right above the bottom bar of your page. Some layouts have different versions of this footer section. These sections usually include contact info, email optins, and other important info. Find one that you want to use and save it to your library for future use. Now whenever you want to build a new page you will have these sections, rows, and modules to choose from. Global can be a great time saver when making future edits to your site, but it takes a little foresight. You need to identify which elements of your layouts will be used frequently throughout your site and will require more uniform updates. Good candidates for Global items would be Footer sections, Call to Action Modules, Button Modules, and Email Optins since they need to be dispersed throughout your site but require the same uniform style and content. This way updating one will update all. I hope that you found these steps to be helpful. My goal for this post was to provide some general guidelines or best practices when importing these layouts on a new install for the purpose of creating a new website. Following these steps in order will keep you from wasting time and set you up with a good foundation to build upon. This is what I was looking for. Great tutorial and tips. Wish there is a “print to PDF” option available for all these posts, so that we can take a print out and keep it handy while working on these layouts!! Thanks for putting this all together. Appreciate it!! Evernote w/ webclipper Chrome extension are your friends! Great list – thank you. I like the layout and style tips best. Some excellent tips. Thanks, Jason! This is lovely and awesome! And also a good primer on workflow for building Divi websites in general. Thank you! I too din’t knew that these many options there. Was I sleeping this long? Tutorial, video and tips – what a combination! I want to make website for infographic submission. Can I make website with divi? This layout is compatible with Extra? Cool! Thank you! I learned many new things about Divi after all this time. 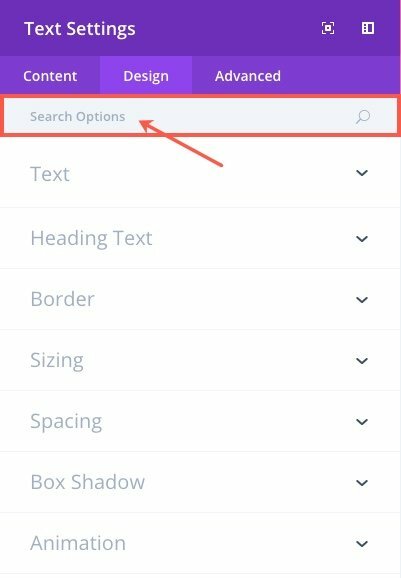 In my DIVI LIBRARU doesn’t appears Import button. Make sure you are clicking the export tab in the portability modal that pops up. Unfortunately, when I click export tab, no pop ups appears. My theme is Extra. Thanks. Thanks Jason, some really helpful tips which I’ll certainly adopt. Reading each post and it’s comments, I have noticed definite a trend of comments that refer to the module customiser’s lack of real options, especially with all the new fancy settings now available in each module. Do you think that this shortcoming will be addressed so we can add it into one of the 10 steps you outlined above? This most certainly helps, I think I tend to do different things on each new website so perhaps having a good routine like this will save time and effort. It would be so much easier if these layout packs would use the theme customizer and if the module customizer would have all module settings so you could have them on a side wide level too. A great overview with a handful of big time savers. Can wait to customize site further. WOW! Jason Thank you, you gave some very helpful tips, I love how you put this tutorial together, much appreciated, and very grateful. If you remember next time could you try and keep your mouse a little more calm while in visual builder! Thank you Jason, for posting this tutorial, very useful for setting up sites quickly. Is there a page, where there is information about updated list of Divi Layouts available here and around the web? I have used combinations of several sections of “Free templates” and I have managed to do crazy but always beautiful things. Awrite, lots of knowledge and passion here, which I like. And some good hints along the way, so all the more reason to get excited. I’m curious about when in the process of using a layout kit I should create a child theme? In almost all cases you will not need a child theme. But if you plan to make php template edits, it will be necessary. The Divi is here, now I’ll test all these options described in this post. Thank you! This is going to save me hours, and help ensure consistency of branding on my websites. Many thanks indeed. Great post on “importing these layouts on a new install for the purpose of creating a new website”. 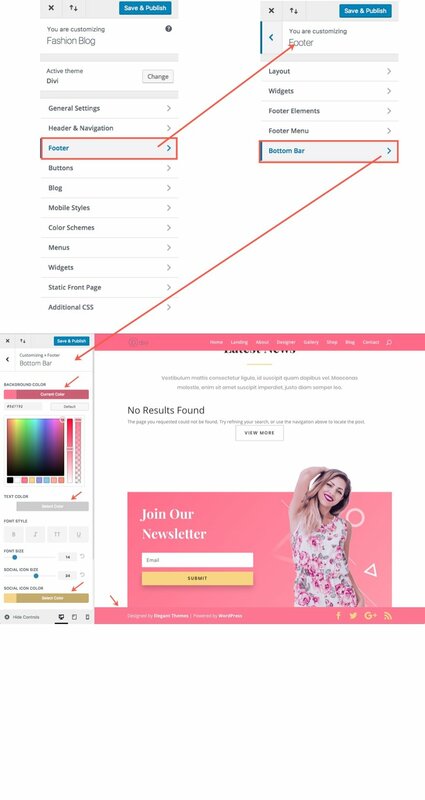 What about for a Divi user who has already built 1 website on Divi on my own where I created a child theme? How do I then start website #2 using a Divi layout pack (without disturbing website #1)?